This article is about that part of a carriageway used by a single line of traffic. For a narrow road in the countryside, see country lane. For other uses, see Lane (disambiguation). In the context of traffic control, a lane is part of a roadway (carriageway) that is designated to be used by a single line of vehicles, to control and guide drivers and reduce traffic conflicts. Most public roads (highways) have at least two lanes, one for traffic in each direction, separated by lane markings. On multilane roadways and busier two-lane roads, lanes are designated with road surface markings. Major highways often have two multi-lane roadways separated by a median. Lane capacity varies widely due to conditions such as neighboring lanes, lane width, elements next to the road, number of driveways, presence of parking, speed limits, number of heavy vehicles and so on – the range can be as low as 1000 passenger cars / hour to as high as 4800 passenger cars / hour but mostly falls between 1500 and 2400 passenger cars / hour. The Ontario Highway 401 in the Greater Toronto area, with 17 travel lanes in 6 separate carriageways visible in the midground. A traffic lane or travel lane is a lane for the movement of vehicles traveling from one destination to another, not including shoulders. A through lane or thru lane is a traffic lane for through traffic. At intersections, these may be indicated by arrows on the pavement pointing straight ahead. An express lane of a road is used for faster moving traffic and has less access to exits/off ramps. In other areas, an express lane may refer to a HOV lane (see below). A reversible lane (contraflow lane) is a lane where the direction of traffic can be changed to match the peak flow. They are used to accommodate periods of high traffic flow, especially rush hour where the flow is predominantly in one direction, on roads that cannot be easily widened such as over bridges. One or more lanes are removed from the opposing flow and added to the peak flow. An auxiliary lane is a lane other than a through lane, used to separate entering, exiting or turning traffic from the through traffic. An acceleration lane or merge lane allows traffic entering a highway to accelerate to the speed of through traffic before merging with it. A deceleration lane is a lane adjacent to the primary road or street used to improve traffic safety by allowing drivers to pull out of the through lane and decelerate safely before turning off a surface street or exiting a freeway. A turn lane is set aside for slowing down and making a turn, so as not to disrupt traffic. By removing turning traffic from the through lanes, motorist safety is improved and delay is removed, but crossing distances for pedestrians are lengthened, increasing their exposure to collisions. A two-way center turn lane is a lane in the center of a roadway to allow drivers traveling in either direction to pause before turning across oncoming traffic (a left turn in right-driving countries, or a right turn in left-driving countries) while waiting for a gap in traffic. A passing lane is sometimes provided on busy two-lane roads to allow drivers to pass slower vehicles without having to cross the center line and risking a head-on collision. A climbing lane, truck lane, or crawler lane is often provided on steep mountain grades, in order to allow smaller vehicles to pass larger, slower ones. The lane is marked only on the uphill stretch and usually a short distance afterward (for regaining speed). An operational lane or auxiliary lane is an extra lane on the entire length of highway between interchanges, giving drivers more time to merge in or out. The lane is created when an entrance ramp meets the highway, and drops out (with an "exit only" sign) to become the ramp at the next exit. A transfer lane of a road is used to move from express lanes to collector lanes, or vice versa; it is somewhat similar to an auxiliary lane. A collector lane of a road is used for slower moving traffic and has more access to exits/off ramps. Dedicated lanes are traffic lanes set aside for particular types of vehicles. A high occupancy vehicle or carpool lane is reserved for carpooling. In the US, they may be marked with a diamond icon every few hundred feet (hence the nickname "diamond lane"), or separated from other lanes by double broken white lines, a continuous pair of double yellow lines, or just a single broken white line. A designated bicycle lane is a portion of the roadway or shoulder designated for the exclusive or preferential use of bicyclists. This designation is indicated by special word or symbol markings on the pavement and "BIKE LANE" signs. A motorcycle lane is provided at certain roads and highways such as the Federal Highway in Malaysia to segregate the motorcycle traffic from the main roadways to reduce motorcycle-related accidents. The motorcycle lane may form a part of the hard shoulder, or may be one or more completely separated lanes. A bus lane is reserved for buses providing public transportation on a fixed route, sometimes with overhead catenary for trolleybuses. In some countries, bus lanes may also be used by some other traffic, such as taxis, bicycles and motorbikes. A tram lane is a lane reserved for the use of buses, trams and taxicabs. It is usually encountered in cities with curbside tram network, such as Zagreb. A truckway is a dedicated lane for longer length trucks; for instance, the Florida Turnpike allows 96-foot long double trailer combinations, in contrast to normal Florida highways' 53-foot limit. Since the major cost of trucking is the fixed cost of the same trailer with its driver the cost per ton of operating with truckway size and weight allowances is 35 to 40 percent below the cost of operations on the non-truckways. In some areas, the lane adjacent to the curb is reserved for non-moving vehicles. A parking lane is reserved for parallel parking of vehicles. A fire lane is the area next to a curb, which is reserved for firefighting equipment, ambulances, or other emergency vehicles. Parking in these areas, often marked by red lines, usually warrants a parking ticket. A loading lane (loading zone in the United States) is an area next to a curb, which is reserved for loading and unloading passengers or freight. It may be marked by a sign ("LOADING ONLY" or "LOADING ZONE") or by a yellow or white-painted curb. A hard shoulder is sometimes called an emergency lane or a breakdown lane, when it is reserved for vehicle breakdowns, and for emergency vehicles. On some congested roads, the shoulder is used as a vehicle lane during peak travel hours. By law or custom, inside lanes are often reserved for faster traffic, and outside lanes are used by slower traffic. An overtaking lane is the lane furthest from the shoulder of a multi-lane carriageway/roadway (sometimes called the fast lane, although this is deprecated by the authorities), i.e. the leftmost lane where traffic drives on the right, or the rightmost lane where traffic drives in the left. The slow lane is the lane nearest to the shoulder of a multi-lane carriageway/roadway, i.e. the farthest from the overtaking lane. These usages lead to the phrases life in the slow lane and life in the fast lane, used to describe relaxed or busy lifestyles, respectively and used as the titles of various books and songs. In general, wider lanes are associated with a reduction in crashes, but in urban settings both narrow (less than 2.8 m) and wide (over 3.1~3.2 m) lanes increase crash risks. Wider lanes (over 3.3~3.4m) are associated with 33% higher impact speeds, as well as higher crash rates. Carrying capacity is also maximal at a width of 3 to 3.1 metres (9.8 to 10.2 ft), both for motor traffic and for bicycles. Pedestrian volume declines as lanes widen, and intersections with narrower lanes provide the highest capacity for bicycles. As lane width decreases, traffic speed diminishes. The widths of vehicle lanes typically vary from 9 to 15 feet (2.7 to 4.6 m). Lane widths are commonly narrower on low volume roads and wider on higher volume roads. The lane width depends on the assumed maximum vehicle width, with an additional space to allow for lateral motion of the vehicle. The maximum truck width had been 96 inches (2.438 m) in the Code of Federal Regulations of 1956, which matches with the width of 8 feet for shipping containers. This was increased to 102 inches (2.591 m) in 1976 which explicitly states to be read[clarification needed] as the slightly larger metric 2.6 metres (102.36 in) width respecting[clarification needed] international harmonization. The same applies to standards in Europe, which increased the allowable width of road vehicles to a current maximum of 2.55 metres (100.39 in) for most trucks, and 2.6 metres (102.36 in) for refrigerator trucks. The minimum extra space had been 0.20 metres (7.87 in) and it is currently assumed to be at least 0.25 metres (9.84 in) on each side. For roads with less traffic it is allowed to build the second or third lane in the same direction to an assumed lower width for cars like 1.75 metres (68.90 in)[clarification needed]; however this is not recommended as a design principle for new roads, as this could be risky if traffic becomes heavier in future. The Interstate Highway standards for the U.S. Interstate Highway System use a 12-foot (3.7 m) standard lane width, while narrower lanes are used on lower classification roads. In Europe, laws and road widths vary by country; the minimum widths of lanes are generally between 2.5 to 3.25 metres (8.2 to 10.7 ft). The federal Bundesstraße interurban network in Germany defines a minimum of 3.5 metres (11 ft 6 in) for each lane for the smallest two lane roads, with an additional 0.25 metres (9.84 in) on the outer sides and shoulders being at least 1.5 metres (59.06 in) on each side. 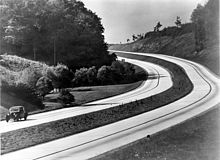 A modern Autobahn divided highway with two lanes per direction has lanes 3.75 metres (12 ft 4 in) wide with an additional clearance of 0.50 metres (19.69 in) on each side;, with three lanes per direction this becomes 3.75 metres (12 ft 4 in) for the rightmost lane and 3.5 metres (11 ft 6 in) for the other lanes. Urban access roads and roads in low-density areas may have lanes as narrow as 2.75 metres (9 ft 0 in) in width per lane, with shoulders at least 1 metre (3 ft 3 in) wide. A typical rural American freeway (Interstate 5 in the Central Valley of California). Notice the yellow line on the left, the dashed white line in the middle, and the solid white line on the right. Also note the rumble strip to the left of the yellow line. For much of human history, roads did not need lane markings because most people walked or rode horses at relatively slow speeds. However, when automobiles, trucks, and buses came into widespread use during the first two decades of the 20th century, head-on collisions became more common. By 1939, lane markings had become so popular that they were officially standardized throughout the United States. The concept of line markings spread throughout the world becoming standard for most roads. Originally the lines were drawn manually with normal paint which would bleach out quickly. After the war, the first machines for line markings were invented and a plastic strip was becoming standard in the 1950s which gradually led to the placement of lane markings on all major roads. ^ "Lane – Definition and More from the Free Merriam-Webster Dictionary". merriam-webster.com. Archived from the original on February 4, 2015. ^ Guide to Traffic Management Part 3: Traffic Studies and Analysis. Austroads. 2013. pp. Section 4. ^ "Glossary". Kurumi.com. Archived from the original on April 24, 2013. Retrieved June 3, 2013. ^ "Rule 14–61 Tandem Trailers on Florida's Turnpike". www.floridasturnpike.com. Archived from the original on November 5, 2012. Retrieved January 2, 2016. ^ "The 2015 Florida Statutes, 316.515(3)(b)2". www.leg.state.fl.us. Archived from the original on December 10, 2015. Retrieved January 2, 2016. ^ Samuel, Peter. "The Way Forward to the Private Provision of Public Roads". Street Smart: Competition, Entrepreneurship and the Future of Roads. pp. 516–517. ^ "Evaluating the Need for Surface Treatments to Reduce Crash Frequency on Horizontal Curves". Texas A&M Transportation Institute. Archived from the original on March 8, 2017. Retrieved March 7, 2017. ^ "Lane Width". Chapter 3: The 13 Controlling Criteria. US Department of Transportation Federal Highway Administration. Archived from the original on May 13, 2013. Retrieved June 3, 2013. ^ "Theo Petrisch, "The Truth about Lane Widths," The Pedestrian and Bicycle Information Center, accessed April 12, 2013". Archived from the original on April 5, 2017. ^ "Federal Size Regulations for Commercial Motor Vehicles". Archived from the original on September 18, 2015. Retrieved September 14, 2015. ^ "EuroTest". Eurotestmobility.net. Archived from the original on March 11, 2012. Retrieved August 8, 2012. ^ "how to paint road marking lines of different widths". Archived from the original on September 11, 2014. ^ "Highway Design Manual: Chapter 60: Nomenclature" (PDF). California Department of Transportation. State of California. Archived (PDF) from the original on March 24, 2012. Retrieved June 3, 2013. ^ "Home - Public Services". www.waynecounty.com. Archived from the original on April 14, 2015. Retrieved May 5, 2018. ^ "MDOT - Hines, Edward N. (1870-1938)". www.michigan.gov. Archived from the original on June 30, 2015. Retrieved May 5, 2018. ^ Douglas V. Jones: The Royal Town of Sutton Coldfield – A Commemorative History, Westwood Press 1994, ISBN 0-9502636-7-2.